Order Syncopated: An Anthology of Nonfiction Picto-Essays, edited by Brendan Burford, available from Amazon.com by clicking on the book cover above! If you read the comics in your daily newspaper, my guest today has probably touched your life. Spider-Man, Hagar the Horrible and Curtis all report to him at his day job as comics editor for King Features Syndicate. But by night—and weekends, no doubt—Brendan Burford is himself a cartoonist dedicated to the notion that comics are more than a 10-second entertainment. He believes in them as journalism, a different way of communicating the events of the day. 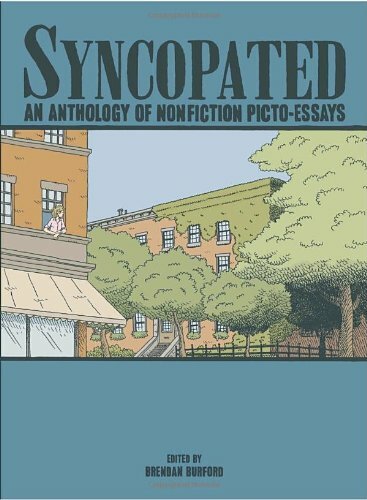 Burford recently published his fourth edition of Syncopated: An Anthology of Non-Fiction Picto-Essays. It is collection of illustrated stories that, at a few pages each, are longer than daily comics and shorter than a graphic novel. This latest edition of Syncopated includes work by Burford himself, as well as graphic artists including Nick Bertozzi, Josh Neufeld and many others. If you’re interested in expanding your comics horizon, you’ll enjoy reading Syncopated.